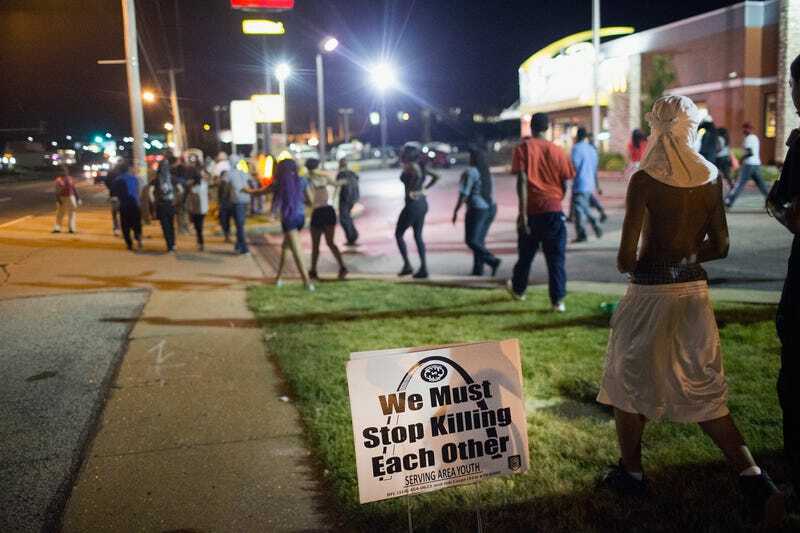 Demonstrators gather on West Florissant Avenue in Ferguson, Mo., in 2015 to mark the one-year anniversary of the shooting death of Michael Brown. Reports indicate a demonstration Aug. 9, 2016, to mark the second anniversary of the unarmed teen’s death was marred by gunfire and a protester being hit by a car. On late Tuesday, the two-year anniversary of Michael Brown's death, a young man was hit by a vehicle at a protest in Ferguson, Mo. Within 30 seconds of the collision, a series of gunshots erupted and could be heard along West Florissant Avenue, as reported by the New York Daily News. The incident, captured on video, involved a white car slamming into the victim, who had stepped into the road while a crowd of protesters were walking along the shoulder. Shortly afterward, a round of at least 20 gunshots could be heard, and protesters were seen running to take cover. It was still unclear whether anyone was injured by the gunfire. A witness said the shots were targeting the white car that had hit the young man. "A young lady pulled out a gun and tried shooting out her tires,” Ferguson Freedom Fighters organizer Larry Miller told the Daily News. “They were chasing the car; she was driving to get away because she didn’t know it was a dead end in the McDonald’s parking lot. "According to the Daily News, the victim's brother took him to a nearby hospital but later returned to the site of the collision, telling witnesses through tears that his brother was in critical condition.